You may not use any other person’s SALEWA username, password or account at any time without the express permission and consent of the holder of that SALEWA username, password or account. If you are under 18, you may use SALEWA’s Websites only with involvement and approval of a parent or guardian. SALEWA will not be liable for any loss or damage arising from your failure to comply with these obligations. You agree not to impersonate any person or entity or misrepresent your identity or affiliation with any person or entity, including using another person's username, password or other account information, or another person's name, likeness, voice, image or photograph. You also agree to notify SALEWA at info@SALEWA.com immediately upon learning of any unauthorized use of your username, password, other account information, or any other breach of security that you become aware of involving or relating to any SALEWA Websites. SALEWA may suspend or terminate your account and your use of any Websites if you fail to comply with these Terms, and SALEWA reserves the right to refuse service, terminate any account, remove or edit Content, and/or cancel orders in SALEWA’s sole discretion. 8. Trademarks. All trademarks, logos and service marks (the "Marks") displayed on the Websites are owned by SALEWA and/or third parties. You are prohibited from using any of the Marks without the express, prior, written permission of SALEWA or such third party. If you would like information about obtaining SALEWA's permission to use the Content on your website, e-mail info@SALEWA.com. Some of the U.S. registered trademarks owned by SALEWA include: DYNAFIT®, SALEWA® and POMOCA®. All other Marks on our Websites and other SALEWA graphics, logos, page headers, icons, scripts, and service names are trademarks, registered trademarks, or trade dress of SALEWA in the U.S. and/or other countries, are owned exclusively by SALEWA. SALEWA's trademarks and trade dress may not be used in connection with any product or service that is not SALEWA's, in any manner that is likely to cause confusion among customers, or in any manner that disparages or discredits SALEWA. All other trademarks not owned by SALEWA that appear on the Websites are the property of their respective owners, who may or may not be affiliated with, connected to, or sponsored by SALEWA. The use or misuse of these trademarks or any materials, except as permitted herein, is expressly prohibited, and nothing stated or implied on the Websites confers on you any license or right under any patent or trademark of SALEWA or any third party. 15. LIMITED WARRANTY: PRODUCTS. SALEWA products are warranted to the original retail purchaser to be free from defects in materials and workmanship for two (2) years from the original date of purchase. Warranties for non-SALEWA products, that is products sold by SALEWA but manufactured by other manufacturers (by way of example, products manufactured by Dynafit, Pomoca, or Wild Country), may be different. Check the materials that come with the non-SALEWA products and that manufacturer’s website for information about their warranties. 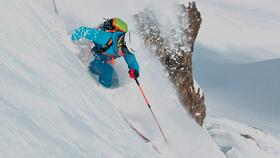 If you purchase a SALEWA product from any SALEWA Websites that you believe is defective, return the product to us pursuant to the DYNAFIT Return Policy (available at https://www.dynafit.com/en-us/custom/index/sCustom/313). Please include your receipt and proof of purchase showing the purchase date. SALEWA will repair or replace the product at our sole discretion. If SALEWA determines that there is no warranty issue with the returned product, the product will be returned to you with a note of explanation. SALEWA’S LIABILITY UNDER THIS LIMITED WARRANTY IS EXPLICITLY LIMITED SOLELY TO SUCH REPAIR OR REPLACEMENT. UPON EXPIRATION OF THE WARRANTY PERIOD, SALEWA SHALL HAVE NO LIABILITY UNDER THIS LIMITED WARRANTY OR OTHERWISE. THE FOLLOWING ARE EXPLICITLY EXCLUDED AND NOT COVERED BY THIS LIMITED WARRANTY: (1) DAMAGES DUE TO NORMAL USE AND WEAR; (2) DAMAGES DUE TO ABUSE OR ACCIDENTS; (3) SALEWA PRODUCTS THAT HAVE BEEN RESOLED OR IN ANY WAY MODIFIED; AND (4) THE FIT OF ANY SALEWA PRODUCT. THIS LIMITED WARRANTY IS IN LIEU OF ALL OTHER WARRANTIES, EXPRESS OR IMPLIED, and except as otherwise specified above, SALEWA MAKES NO WARRANTY OF ANY KIND, EXPRESSED OR IMPLIED, INCLUDING WITHOUT LIMITATION ANY WARRANTY OF MERCHANTABILITY OR FITNESS FOR A PARTICULAR PURPOSE, OR ANY WARRANTY AS TO THE DESIGN, CONDITION OR QUALITY OF MATERIALS AND WORKMANSHIP TO THE PURCHASER OF THE GOODS AND/OR ANY OTHER PERSON WHATSOEVER. NOTHING CONTAINED IN THE FOREGOING SENTENCE IS INTENDED TO RELEASE THE SELLER FROM LIABILITY FOR ORDINARY DAMAGES FOR PROVEN PRODUCT LIABILITY CLAIMS. (14) By continuing to use the SALEWA Websites, you hereby agree and intend to be bound by these Terms.